Pirata has been a professional captain of ocean racing yachts and expedition yachts for past 15 years. 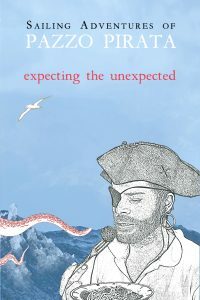 His novels describe the most amazing adventures that he’d lived during his sailing travels to over 100 countries. He has also participated (as a captain of the expedition yacht) in the production of extraoridinary documentary film ‘Aquarela’ (dir. Victor Kossakovsky), which was partly shot in Arctic and on the open ocean. Currently, Pirata is aiming to participate in Vendee Globe 2020, a single-handed non-stop around the world race. He is also working on his ultimate sailing dream – Ultime Expedition, a documentary film project set around circumnavigation of each continent.